In The Force Awakens movie, there are essentially two main heroes-- Rey and Finn. The story is about their reluctance to join the call of the hero’s journey, and how they got involved in the search for Luke Skywalker. There is more to that (ex Poe Dameron is amazing), but for brevity let’s focus on these heroes. Rey and Finn. Finn and Rey. Disney–Lucasfilm Press has done something unique in splitting the story of The Force Awakens into two junior novels to focus on Rey and Finn. Below is my review on both stories. Both junior novels feature artwork by Brian Rood. Finn’s Story was written by Jesse J. Holland and is available in paperback and eBook format. The story pulls back to just before The Force Awakens and then goes through Finn’s scenes in the story. My favorite chapter was thirteen. In that chapter, Finn is brought back into the fight after the First Order unleashed destruction from Starkiller Base, and was handled really well. The beauty of this junior novel is that it absorbed elements from the junior novel Before the Awakening, elements from the movie that were not in the screenplay, and the added touches by Holland. I was glad that this story was able to flesh out the Nines vs Finn battle. Both novelizations of The Force Awakens did not have the additions to that scene from the movie, due to adjustments to the script. Does this story reveal the parts of the story that Finn was not in? No, but that is what makes this story special. It felt like a retelling of events from Finn himself, like through a diary, or simply recounting to a friend. Rey’s Story was written by Elizabeth Schaefer and is available in paperback and eBook format. The story follows Rey throughout her journey in The Force Awakens. Schaefer adds elements as well from the Before the Awakening junior novel, and her own flair to the story. My favorite chapter was eleven. In that chapter, Rey, Finn, and Han are conversing, with Maz Kanata. I found the pacing and dialog to be just amazing! The charm of this story was how Schaefer could flesh out Rey’s unspoken dialog moments. The prologue especially grabbed me. Schaefer did a wonderful job at shaping the way a scene is painted mentally. Like Finn’s Story, the junior novel does not tell the complete story of The Force Awakens; however, I am glad of that. The point of these stories is to add a new layer to the overall story. The stories together paint a wonderful picture of the story The Force Awakens from the hero’s perspective. Together you get most of the story, but not the complete picture. How these stories can be applied is something potentially magical. There have been multiple retellings of The Force Awakens at this point; however, most are middle grade and higher. I may not be a parent but I can imagine using Finn’s Story and Rey’s Story as the first step of exploring The Force Awakens. From there one could read Before the Awakening and The Force Awakens junior novelization (as the second step). Then, one could read short story “Bait”, The Perfect Weapon novella, and The Force Awakens adult novelization (as the third step). Finally, one could then watch the movie The Force Awakens, bringing it all together. 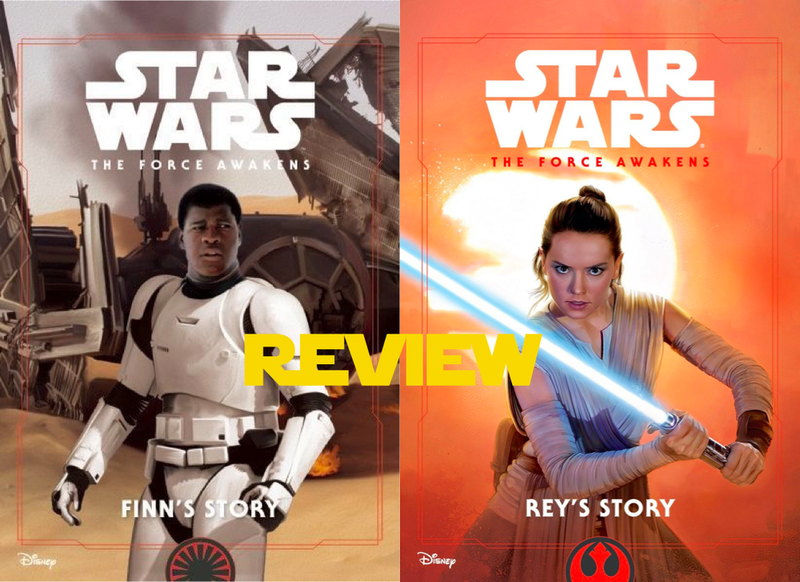 Rey’s Story and Finn’s Story are very interesting reads. If you are looking for a complete experience, then you will probably be left wanting more. These stories are unique as they take slices of the movie and supplemental material to paint a focused perspective of the movie. They could easily be read as bedtime stories (suggested reading order Finn and then Rey), or given to young readers to read alone. As an adult, I found enjoyment in both! Highly Recommend!